A traveler in the Brussels airport after Tuesday’s attacks. Three explosions struck Brussels on Tuesday morning — two in the city’s international airport and one in a subway station. Dozens were killed and more were injured. The brutality of the bombings was sadly familiar, as were their targets. The attacks in Brussels echoed the 2004 Madrid train bombings and the 2005 London subway bombings. 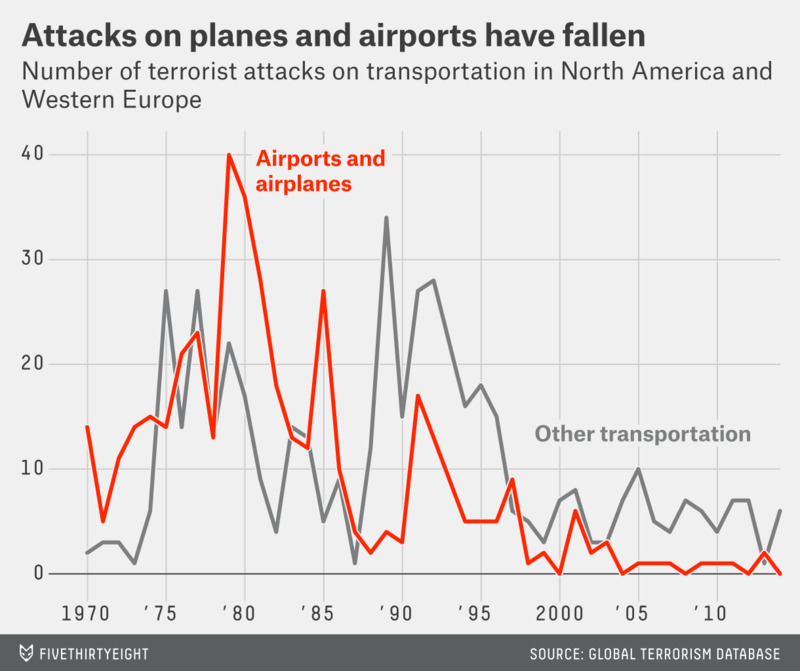 The number of plane-related terrorist attacks peaked in 1979, when there were 40 attacks amid a wave of hijackings that defined the era’s air travel. The later peaks for transportation attacks outside of air travel in the ’80s and ’90s partly reflect Irish Republican Army attacks (which accounted for 21 percent to 61 percent of other transportation-related attacks from 1989 through 1992, depending on the year). The Basque Fatherland and Freedom (ETA) group accounted for an additional 19 percent to 76 percent of non-air transportation attacks from 1988 to 1992, again depending on the year. Since 9/11,4 security at airports has radically changed, and you may be able to see its effect in the number of attacks: From 2002 through 2014,5 airports and airplanes in Western Europe and North America were targeted only 13 times. These attacks included the 2002 shooting at Los Angeles International Airport and the 2007 car bombing at Glasgow Airport. Attacks on other forms of transportation have also fallen sharply from the 1980s and early 1990s, although the rate of attacks from 2002 to 2014 was higher than that of airports (70 total, an average of more than five per year). Attacks on any form of transportation are a small share of all terrorist attacks (these targets accounted for only 4 percent of all attacks in Western Europe and North America from 2002 through 2014). However, such attacks were disproportionately deadly. Terrorism directed at all forms of transportation (airports included) from 2002 through 2014 claimed nearly as many lives as attacks on the top four most frequent targets put together (private citizens or property, businesses, governments and police). In this time period, 252 people were killed as a result of attacks on all forms of transportation, and 265 were killed by attacks on those four targets combined. There are fewer transportation hubs than private businesses, but they’re more crowded spaces. I restricted my analysis to these regions because they’re the most similar to Brussels. Terrorism is often driven by regional conflicts, so global data can obscure more than it reveals. You can read more about how the Global Terrorism Database compiles its data set here. To be included in the database, an attack must be intentional and violent (or include the threat of violence), and it must be carried out by a subnational group. Additionally, at least two of these three criteria must apply: The attack must have a political, economic, religious, or social goal; the attack must be meant to send a message to more than just the people directly affected; and it must be outside the context of legitimate war. The database doesn’t categorize 9/11 as having targeted transportation infrastructure. Instead, it’s classified as an attack on private citizens or property that happened to use aircraft as a weapon. 2014 is the most recent year included in the Global Terrorism Database.